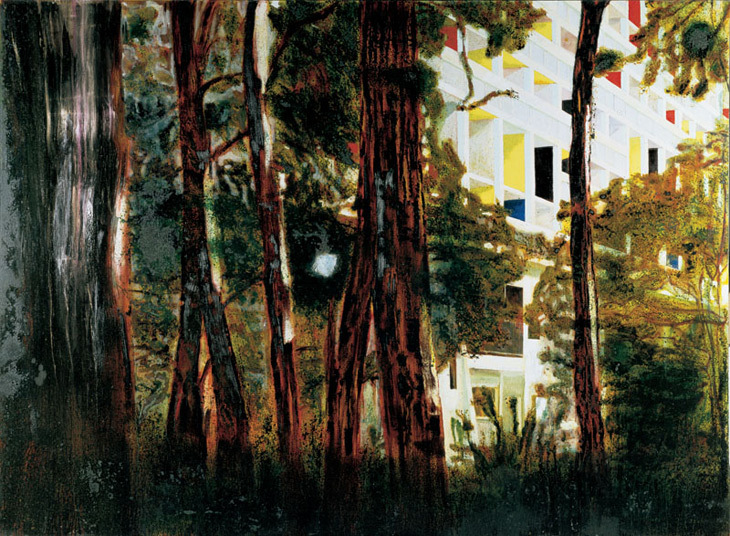 Peter Doig’s paintings of Le Corbusier’s classic modernist apartment block offer a mysterious Utopia: cosmopolitan dream architecture nestled in (or imprisoned by) tangling wilderness. In Concrete Cabin, it’s the nowhereness of the scene which is strangely uncanny: the bright minimalist grid of the building beaconing through the dark shadows of the trees; an everyday glimpse from a suburban sidewalk twisted into something magical; a set from a contemporary fable. Peter Doig paints this scene with chimerical effect; cropping the image to exclude ground or sky, it has no physical orientation or weight, only the intangible presence of a fleeting moment.